The word "barber" comes from the Latin word "barba" which means "beard." According to the National Barber Museum in Winchester, Ohio, "The first barbering services were performed by Egyptians in 500 B.C. with instruments they had made from oyster shells or sharpened flint." 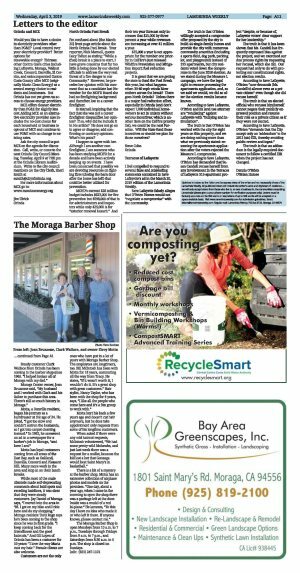 Thankfully, The Moraga Barber Shop, located at 1431 Moraga Way, in the Moraga Shopping Center, has been using up-to-date implements to cut hair at the same location for 54 years. Historically, the colors of the barber shop pole emerged during the Middle Ages when the shops also served as medical houses. Barbers were also considered surgeons and dentists, because of the tools and instruments they possessed. And, due to the fact that most of the population was illiterate, signs outside of businesses bore pictures more often than not. The red in a barber pole represents bloodletting, while the white was meant to signify the bandages used to wrap the wounds. The blue is said to represent the non-oxygenated blood in the veins. 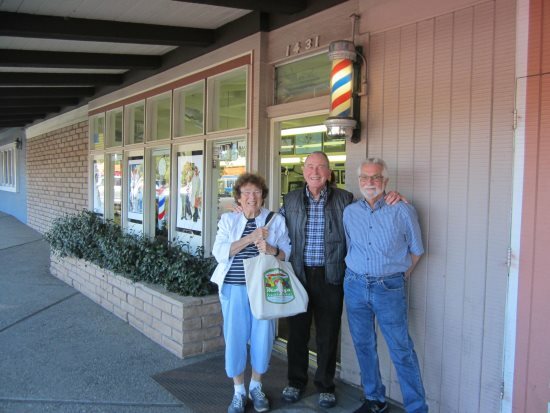 Moraga's barber shop was originally owned by Jack Del Pozo, who started Jack's Barber Shop in 1965. Second owner, Gary Cargile, purchased the business in 1985. The third and current owner, Elroy Motta bought the barber shop in 2000. Steady customer Clark Wallace from Orinda has been coming to the barber shop since 1965. "I helped broker all of Moraga with my dad." Moraga Center owner, Joan Bruzzone said, "My husband and I worked with Clark and his father to purchase this area. There`s still so much history in Moraga." Motta, a Danville resident, began his journey as a hairdresser at the age of 24. He joked, "I got too slow and couldn't outrun the husbands, so I got into carpet cleaning instead." In 1992, he answered an ad in a newspaper for a barber's job in Moraga, "and here I am!" Motta has loyal customers coming from all areas of the East Bay, such as Oakland, Danville, Concord and Pleasant Hill. Many more work in the area and stop in on their lunch breaks. While most of the male clientele made self-deprecating comments about bald spots and receding hairlines, it was clear that they were steady customers. Jay Daniel of Moraga says, "I moved into the area in '98. I get on my bike and I ride here and do my shopping." Moraga resident Tony Rago says he's been coming to the shop since he was in first grade. "I keep coming back for the friendliness and the good haircuts." And Gil Lopez of Orinda has been a customer for 10 years: "I love the way Maria cuts my hair." Female clients are also welcome. 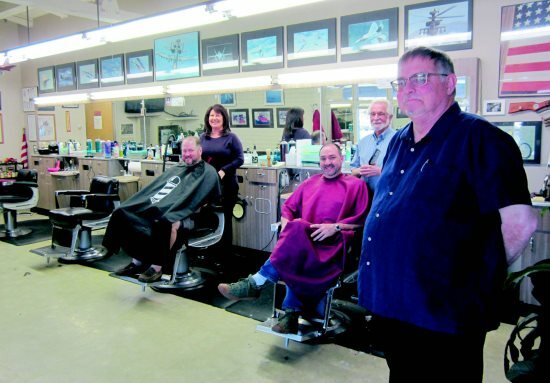 Customers are not the only ones who have put in a lot of years with Moraga Barber Shop. The employees are longtimers, too. Bill McIntosh has been with Motta for 18 years, commuting all the way from Tracy. He states, "If it wasn't worth it, I wouldn't do it. It's a great shop with great customers." Hair stylist, Nancy Taylor, who has been with the shop for 9 years, says, "I like all the people who come here and it's a fun group to work with." Motta hurt his back a few years ago and doesn't cut hair anymore, but he does take appointment only requests from some of his longtime customers. When asked if there were any odd haircut requests, McIntosh volunteered, "We had some pretty wild Mohawks, and just last week there was a request for a mullet, because the kid lost a bet that Gonzaga would beat Saint Mary's in basketball." There is a bit of a mystery at the barber shop. Motta has an extensive collection of airplane photos and models on the premises. "One day, about a year ago, when I came in the morning to open the shop there was a package left at the door. Inside was a model of a red bi-plane." He laments, "To this day I have no idea who made it or who left it there. If anyone knows, please contact me." 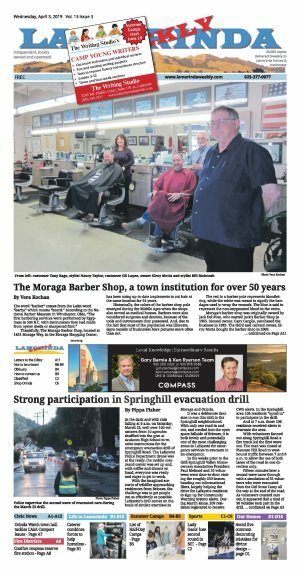 The Moraga Barber Shop is open Mondays from 10 a.m. to 7 p.m., Tuesdays through Fridays from 9 a.m. to 7 p.m., and Saturdays from 8:30 a.m. to 4 p.m. The shop is closed on Sundays.